The image above represents the 1539 documents in the IAM OffLine Handwriting Database 3.0. 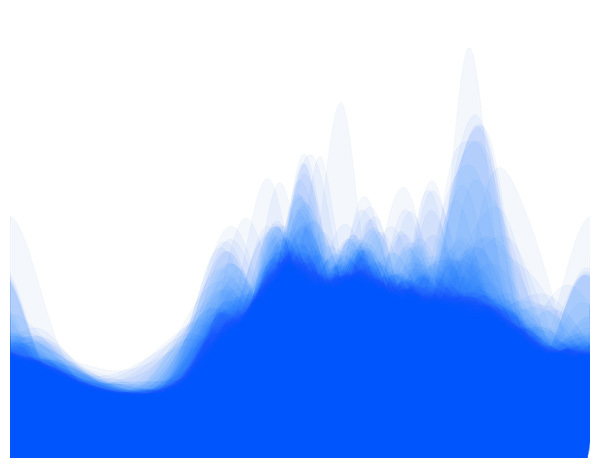 Each curve is the probability density function of the local orientation of the handwriting contour in a document. From left to right the orientations vary between (-90 +90] degrees. It is visible that there are relatively few leftwards slanted scripts in this population sampled from the Swiss canton of Bern. Also, a right script slant induces a shear effect on the written shapes as suggested by the curves with high amplitude on the right side of the image. Check out Rex for more orientation profiles or this poster for details about the method.